3 bedrooms, 2.5 baths, full kitchen, laundry, fireplace, 2 car garage, fenced yard, 2300sf. Sorry, no pets. Only a 7 minute drive to the Square! 2300sf, 3 bedrooms; 2 king bedrooms with attached full bath or 3/4 bath, 1 queen bedroom with a one half bath. Free WiFi, washer and dryer. 2 story with garage, fenced yard. HOW SWEET IT IS! Carriage House is a wonderful 2300sf home near downtown Prescott on a hillside half acre. Only 7 minutes to drive to the square. Close to shopping and restaurants. Accommodates 6 persons in 3 bedrooms, each with private bath access, great kitchen with granite counters, fully fenced backyard and hillside lot with views. The house has elegant yet casual decor with a gas log fireplace in living room and a gas flame stove in the family room. Watch your children around heat sources! There are watercolors, oil paintings and other art and collectibles in each room that make this home extra special. The living and dining rooms, which are on the 2nd floor, have beautiful eastern views of Mingus Mountain and even the San Francisco Peaks in Flagstaff through 9 foot wide sliding glass doors or from the full length balcony. There is a comfortable sofa and 2 armchairs in front of the slate and maple faced fireplace for conversation and relaxation. The dining table seats 6. A stereo is also in this area . Step outside onto the balcony that extends full length across the front to enjoy those views with sunrise coffee, evening drinks or amazing stargazing. Ever seen the Milky Way? You can here! The family room is also on the 2nd floor is adjacent to the kitchen. It has large windows on 3 sides & a HDTV big screen, a gas log flame stove and Pergo floors. A leather sofa, 2 comfy leather swivel/rocking recliners and several floor pillows. There is complimentary wireless internet access. Our kitchen is a cook's delight with gorgeous granite counters, custom maple cabinets, new 20' porcelain floor tile, a 6 burner gas stove, JennAire fridge with ice maker, microwave, dishwasher, all pots and pans, coffee maker, 4 slice toaster, blender, even a waffle maker, good kitchen knives, loads of counter space. Starter dishwasher liquid and kitchen cleansers provided. Each of the bedrooms has been thoughtfully designed to be separate and offer privacy. The bedrooms are tastefully decorated and comfortable. There are 2 masters upstairs on the main living level (2nd floor). These 2 bedrooms are situated for your privacy at either end of the living room. The first master has a carved oak 4 poster king pillow-top mattress bed, dresser, full bath with granite counter and hairdryer, TV and a private balcony. The colors are soft greens and lilac. The 2nd master king bed upstairs has a memory-foam topped Stearns and Foster king bed, dresser, comfortable Queen Anne chair, an armoire with a TV, private access to a 3/4 bath with hairdryer, and a patio door that opens to another balcony sitting area. Colors in this room are soft green and rich, deep maroon. The 3rd bedroom is located on the ground floor, garage level. There is a queen bed and an attached one half bath. All main living areas are on the upper floor. A large capacity washer and dryer, iron and ironing board are down on the garage, lower level. Starter laundry detergent (enough for 3 or 4 loads) is provided for our guests. The main living level is upstairs on the 2nd floor up from the garage level so there are stairs to climb inside and out, although there is a concrete sidewalk around the side of the house into the family room. Children must be supervised because of the stairs, balconies and a retaining wall. The sloping concrete sidewalk from the front of the house to the backyard patio can be accessed through a gate if you have trouble navigating steps. From the patio you can enter into the family room via a short ramp. The lower ground-floor(garage entry level) has the large laundry room and the reading room. Central gas heat and air conditioning plus an evaporative cooler for the drier summer months will keep you comfortable all seasons. In spring and summer relax and enjoy our lovely and cool wisteria draped gazebo on the back patio and the gas grill and table for up to 6. Shower gel, shampoo, conditioner and hair dryers provided in each bathroom. Coffee, assortment of teas, and starter condiments are stocked. Our home is spotlessly clean featuring quality furnishings, antiques, collectibles and original art. There is enough parking for 3-4 cars or small boat; inquire for details. Carriage House is perfect for your vacation! Come and enjoy!! Lodging, and cleaning fee Tax for 29+ days is 2.75%. Cleaning fee: $150 + depends on # of beds/baths used, length of stay, and number. Add tax and refundable security deposit. See the rate section for additional rates and information. Housekeeping services can be arranged for $25 per hour with a 2 hour minimum. VRBO booking fees are additional and are billed directly by HomeAway Payments when you make the reservation. 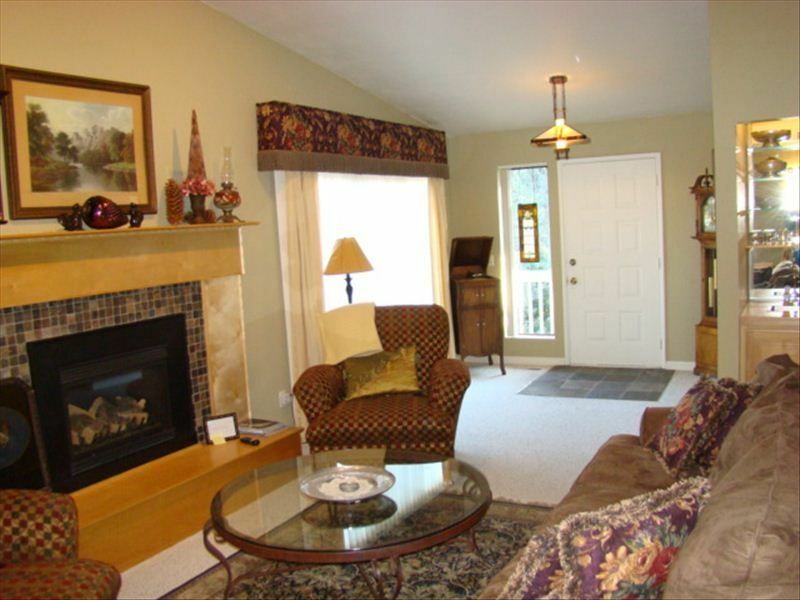 We were looking for a beautiful home where we could retire and we found it in Carriage House. We have decorated and furnished it with quality pieces and art not just to please our guests, but for ourselves. It has great views, plenty of room to roam and gardens to enjoy all year long. Being only minutes from shopping and restaurants was high on our list of must haves. Squeeky clean and quality furnishings. Coffee, teas,sugar, and basic spices are stocked for your enjoyment. The house is spotlessly clean, beautifully furnished and will have just about every amenity you could ever wish for in a vacation rental... or even in your own home! Complimentary starter detergent for 2-4 loads provided. housekeeping during your stay may be arranged for an additional fee. We were looking to purchase a vacation home in Prescott and this worked out great for us to stay during our search. Just the two of us plus Bentley so the house was larger than we needed, but we were pleased that it had everything we needed to make us feel at home. The owners are wonderful to work with and seemed more like good friends. The back yard is spacious and fenced so plenty of room for Bentley to explore and we enjoyed walking around the neighborhood with lots of nature and woods. Very convenient to hop in the car and go downtown or to discover some great restaurants! Love Prescott!! Absolutely stellar guests! Thanks for staying. Just returned to Omaha, Nebr, after spending 6 wonderful weeks, at the Carriage House, in Prescott. It is as advertised, very large, room for everyone and everything is provided. A great location, seculed, very quiet, no traffic, and great views. The house is well decorated, great King beds, and my favorite, a large gas fireplace, in the living room that I used every day. The owners are wonderful to work with and provide a great home for all their guests. This was my fifth trip to Prescott, and will be back to stay here again. I love Prescott, I love the people of Prescott, and I love the Carriage House. We stayed at Carriage House for the entire month of August. The property is conveniently located in a very quiet neighborhood minutes from town. The house was extremely clean and well maintained, comfortable beds and furniture. Kitchen well equipped. Ellen was very easy to work with and was always quick to respond to any questions. I would recommend Carriage House without hesitation. Mary and her family were wonderful guests. We appreciate her concerted efforts to have her review posted after a mixup by VRBO. This home was great to stay in for the month I was there. It was well-stocked and in a quiet, lovely setting. The owner was very responsive for any questions I had. Prescott is a very friendly town, and the people in the neighborhood were as well, very welcoming. Thank you for providing such a cozy, homey place to call home away from home. Wonderful, welcoming home. Well furnished and everything ready for a great stay. Owners very responsive to every request. Great yard for dogs, family, relaxing. Really enjoyed our stay at Carriage House! We recently stayed at Carriage House and had such a great experience. The owners were very helpful from start to finish. The house was lovely and so comfortable. We felt at home from the start of our stay. The bedrooms were spacious and nicely decorated and the beds were very comfortable. We enjoyed the fireplace in the TV room, it was a great space to watch movies, play board games and just hang out. The kitchen was well stocked and the whole house was so clean and well maintained.The neighborhood was nice and very quiet. I definitely recommend this house to anyone wanting to stay in Prescott. Thanks Ellen and Michael for everything. Jenny and family took such great care with our home. They are terrific guests! Thanks for the review. Cleaning fee $150-$250+. Depends on # staying, pets, and length of stay. Monthly Tax 2.75% per month. No smoking or Vapor cigarettes. Refundable security/damage deposit $500. Parties such as graduation, wedding, showers, teams etc. are not allowed. Carpet cleaning for spills, stains or pet issues will be charged at $45 per area cleaned. Kitchen appliance cleaning is the guest responsibility, If you do not wish to detail clean appliances on check-out a charge of $25 will be applied.